This post serves as an introduction to a "homebrew" video game console made from scratch, using a lot of inspiration from retro consoles and modern projects but with a unique architecture. Some friends of mine have told me again and again not to keep this project to myself and to put this information online, so here it goes. My name is Sérgio Vieira and I’m a Portuguese guy who grew up in the 80s and 90s, I’ve always been nostalgic towards retro-gaming, specifically the third and forth generation consoles. A few years ago I’ve decided to learn more about electronics and try to build my own video game console. Professionally I work as a software engineer and had no experience with electronics other than occasionally building and upgrading my desktop computer (which doesn’t really count). Even though I had no experience, I said to myself “why not?”, bought a few books, a few electronics kits and started to learn what I felt I needed to learn. I wanted to build a console that would be similar to those which are nostalgic to me, I wanted something between an NES and a Super Nintendo or between a Sega Master System and a Mega Drive. These video game consoles had a CPU, a custom video chip (in those days it wasn’t called a GPU) and an audio chip either integrated or separate. Games were distributed in cartridges, which were basically hardware extensions with a ROM chip and sometimes other components as well. 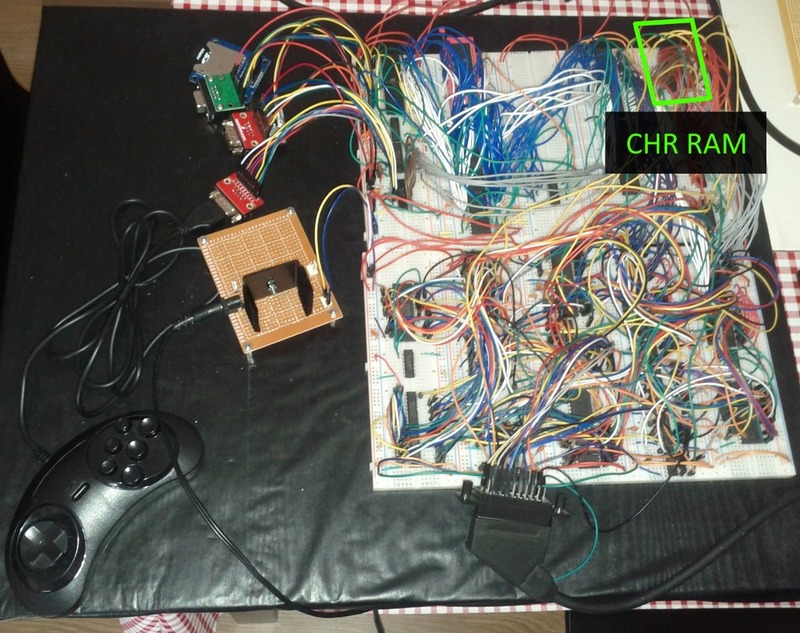 I had the second microcontroller (PPU, Picture Processing Unit, which is an Atmega1284 also at 20Mhz) generate an image to a RAM chip (VRAM1) while the first one would dump the contents of another RAM chip (VRAM2) to the TV. 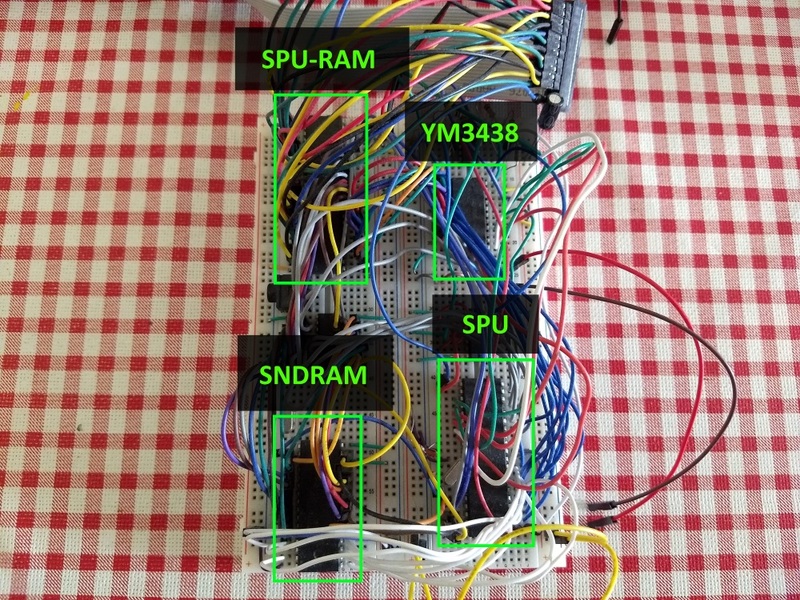 After one frame (2 frames in PAL or 1/25th of a second), the VPU switches the RAMs, and dumps the image generated into VRAM1 while the PPU generates an image to VRAM2. The video board turned out quite complex as I had to use some external hardware to allow for the two micro-controllers to access the same RAM chips and also to speed up the access to RAM that also had to be bit-banged, so I added some 74 series chips such as counters, line selectors, transceivers, etc. 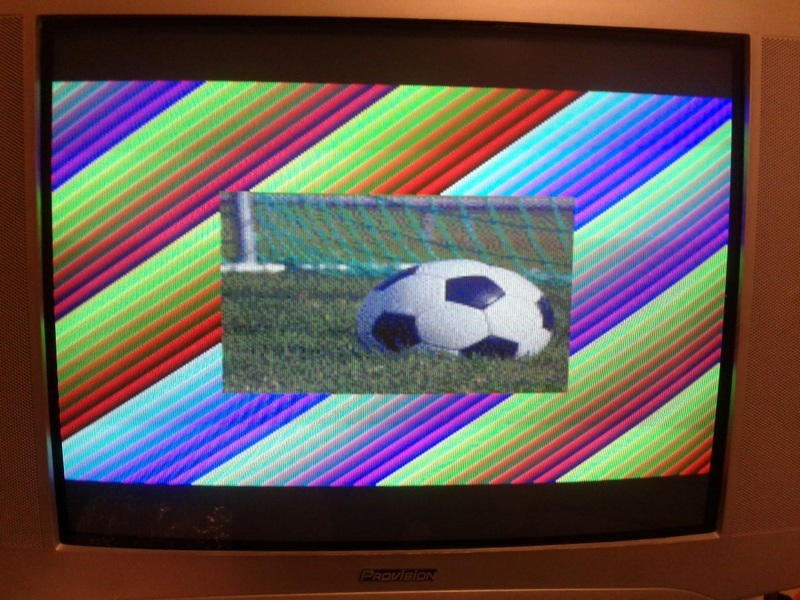 I ended up having the PPU generate a 224x192 pixel image that is then sent to the TV by the VPU. This resolution might seem low, but it is in fact only a bit lower than the consoles mentioned above that usually had resolutions of 256x224 pixels. The lower resolution allowed me to cram more graphical features into the time I had to draw each frame. Just like in the old days the PPU has “fixed” capabilities that can be configured. The background that can be rendered is composed of 8x8 pixel characters (sometimes called tiles). This means a screen background has the size of 28x24 tiles. 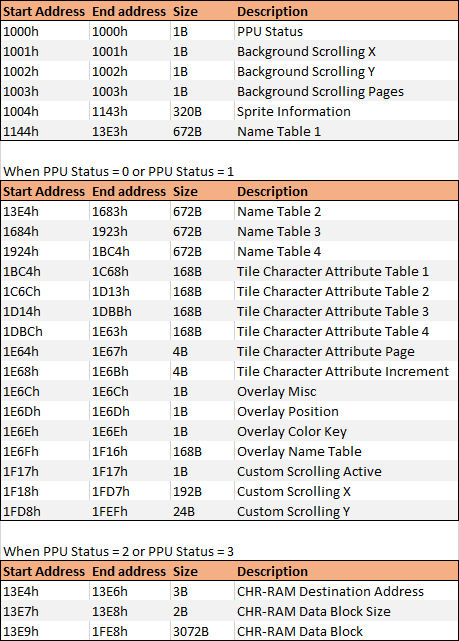 Above the background, the PPU can render 64 sprites that can have a width and height of either 8 or 16 pixels (1, 2 or 4 characters) and can be flipped horizontally or vertically or in both axes. Also above the background an “overlay” can be rendered, which is a patch composed of 28x6 tiles. This is useful for games that need a HUD and in which the background is scrolling and sprites are being used for other purposes than to show information. Other “advanced” feature is the ability to scroll the background in different directions in separate lines, this enables games to have effects such as a limited parallax scrolling or split-screen. One of the reasons I chose the Z80 (other than it just being a cool retro CPU) was because the Z80 has access to a 16bit memory space and a 16bit IO space, something that other similar 8-bit CPUs do not have, such as the famous 6502. The 6502, for example, only has a 16bit memory space, which means that the whole 16bits were not reserved just for memory but had to be shared between memory access and external device access, such as video, audio, inputs, etc. By having an IO space together with a memory space, I could have the whole of the 16bit memory space reserved for memory (64KB of code and data) and have the IO space for communication with external devices. The next thing I implemented was the interaction between the CPU and the PPU. For this I found “an easy solution” which was to get dual-port RAM (a RAM chip that can be simultaneously connected to two different buses), it saves me from having to place more ICs like line selectors and such and also it makes the accesses to the RAM between both chips virtually simultaneous. The PPU also communicates with the CPU directly by activating its NMI (non-masking interrupt) every frame. This means the CPU has an interrupt every frame, which makes it valuable for timing and knowing when to update graphics. The PPU copies the information of the PPU-RAM to internal RAM. the PPU renders the image based on the information it had previously copied to one of the VRAMs. the VPU sends the image in the other VRAM to the TV. However I found out I could get my hands on vintage chips relatively easily, and I ordered a few YM3438 FM synthesis chips, these sound chips are fully compatible with the YM2612 which is the one found in the Mega Drive/Genesis. By integrating this chip, I could have Mega Drive quality music along with sound effects produced by a microcontroller. The CPU controls the SPU (Sound Processor Unit, the name I gave to the microcontroller that controls the YM3438 and produces sound on its own) again through a dual-port RAM, this time only 2KB in size. Similarly to the graphics module, the sound module has 128KB for storing sound patches and PCM samples, the CPU can load information to this memory through the SPU. This way the CPU can either tell the SPU to play commands stored in this RAM or update commands to the SPU every frame. The CPU controls the 4 PWM channels through 4 circular buffers present in the SPU-RAM. The SPU will go through these buffers and execute the commands present in them. In the same way there is another circular buffer in the SPU-RAM for the FM synthesis chip. The SPU copies the information in the SPU-RAM to internal RAM. The CPU updates the buffers for the PWM channels and for the FM synthesis chip. the SPU executes the commands in the buffers regarding the information in its internal memory. Continuously while all of the above happens, the SPU updates the PWM sound at a frequency of 16Khz. CHRRAM: 128KB RAM, holds the custom background tiles and sprites graphics (in 8x8 pixel characters). VRAM1, VRAM2: 128KB RAM (43008 bytes used), they are used to store the framebuffer and are written to by the PPU and read by the VPU. PPU (Picture Processing Unit): Atmega1284, draws the frame to the framebuffers. 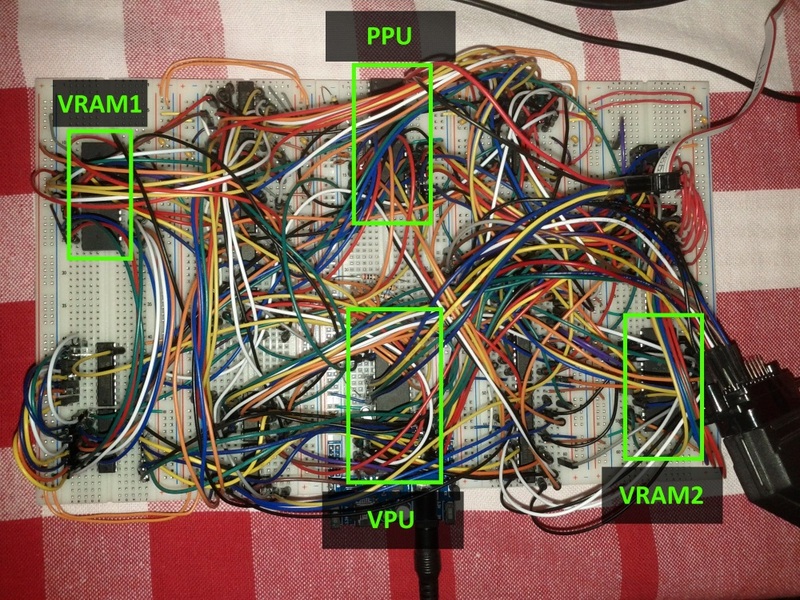 VPU (Video Processing Unit): Atmega324, reads the framebuffers and generates an RGB and PAL Sync signal. SPU-RAM: 2KB Dual-port RAM, serves as an interface between the CPU and the SPU. SNDRAM: 128KB RAM, holds PWM Patchs, PCM samples and FM Synthesis instruction blocks. YM3438: YM3438, FM Synthesis chip. 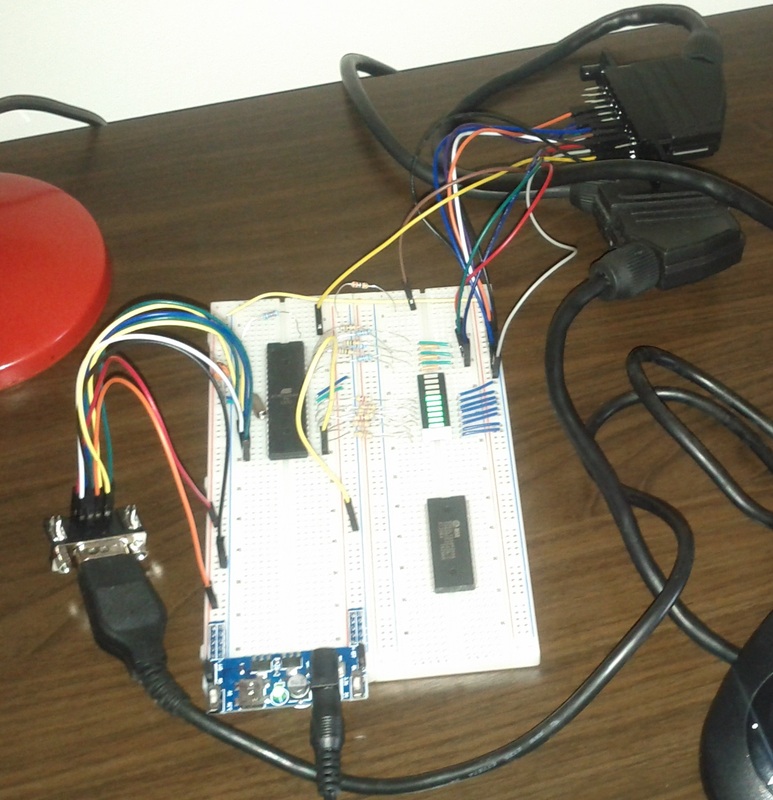 SPU (Sound Processing Unit): Atmega644, generates PWM-based sound and controls the YM3438. 8-bit CPU Zilog Z80 operating at 10Mhz. 8KB of ROM for bootloader. Reading data from FAT16/FAT32 SD Card. 25 fps (half PAL fps). 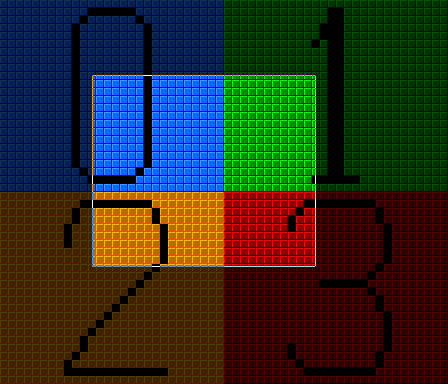 2x2 virtual background space (448x384 pixels), with bi-directional per-pixel scrolling, described using 4 name tables. 64 sprites with width and height 8 or 16 pixels with possibility of being flipped in X or Y axis. Background and sprites composed of 8x8 pixels characters. Character RAM with 1024 background characters and 1024 sprite characters. 64 independent background horizontal scrolling in custom lines. 8 independent background vertical scrolling in custom lines. Overlay plane with 224x48 pixels with or without colorkey transparency. 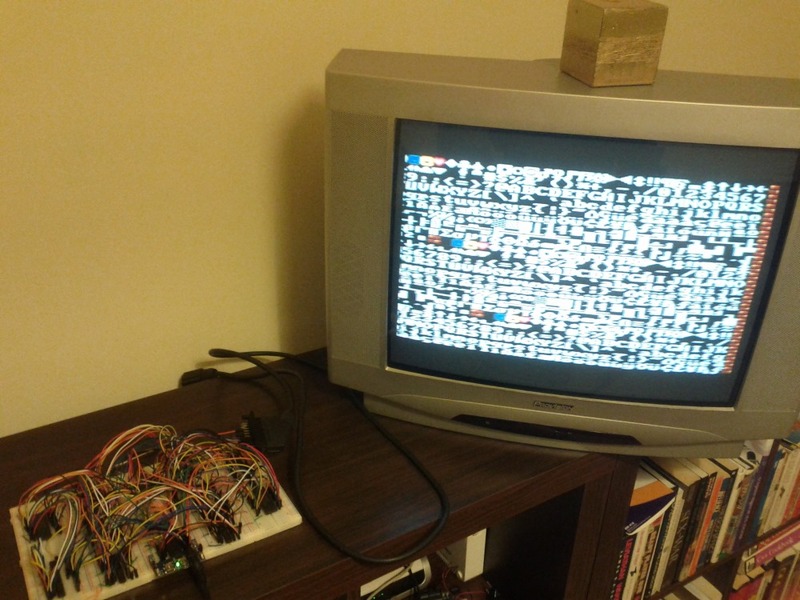 RGB and Composite PAL output through SCART socket. PWM generated 8-bit 4 channel sound, with pre-defined waveforms (square, sine, sawtooth, noise, etc.). 8-bit 8Khz PCM samples in one of PWM channels. 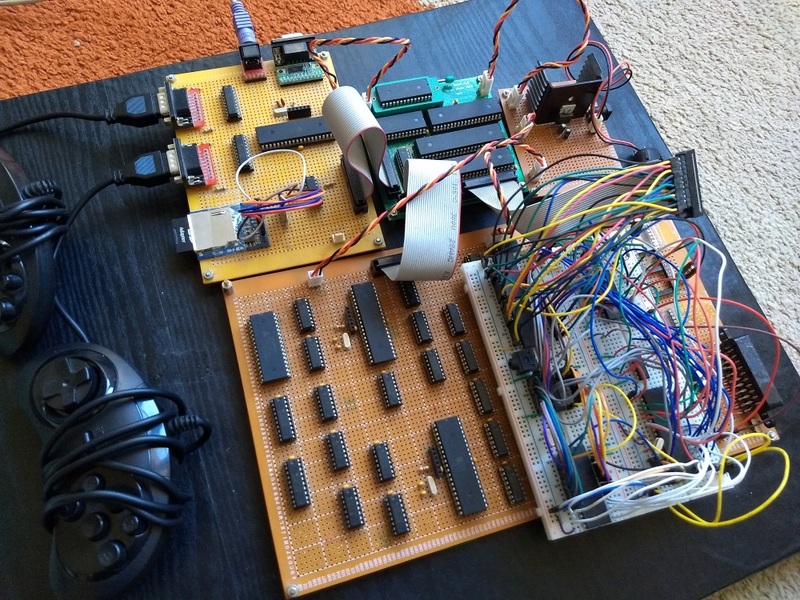 YM3438 FM synthesis chip updated with instructions at 50Hz. One piece of software that was written for the console was the bootloader. 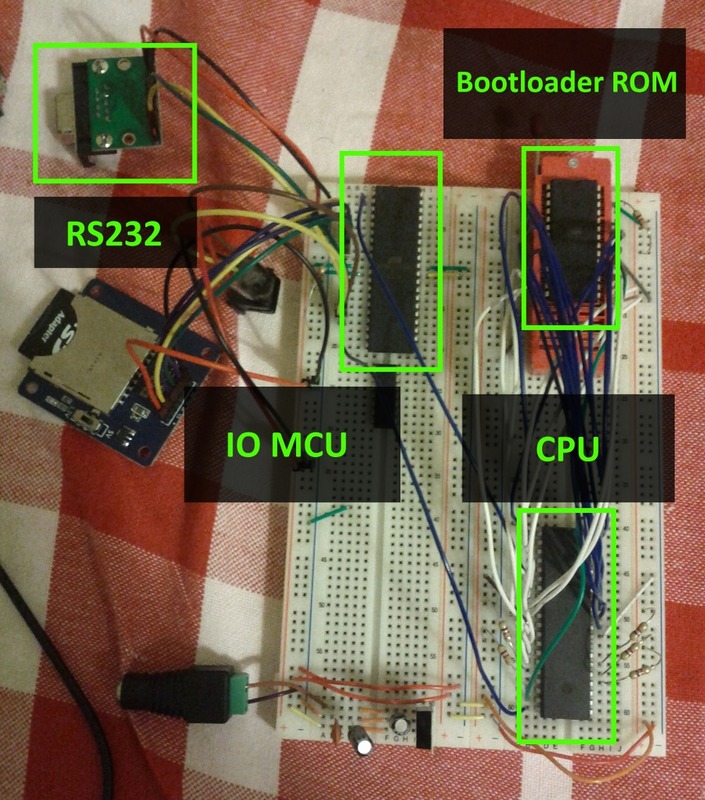 The bootloader is stored in the CPU-ROM and can occupy up to 8KB. It uses the first 256 bytes of the CPU-RAM. It’s the first software to be run by the CPU. It’s purpose is to show the programs available in the SD Card. These programs are in files that contain the compiled code and may also contain custom graphics data and sound data. After being selected, the program is then loaded into the CPU-RAM, CHR-RAM and SPU-RAM. And the respective program is executed. The code of the programs that can be loaded into the console, can take up the 56KB of the RAM, except the first 256 bytes and of course have to take into account the stack and also leave space for data. Both the bootloader and programs for this console are developed in a similar fashion, here’s a brief explanation on how these programs are made. One thing to note when developing for the console is how the CPU can access the other modules of the console, therefore memory and io space mapping are crucial. The CPU accesses its bootloader ROM and RAM through the memory space. 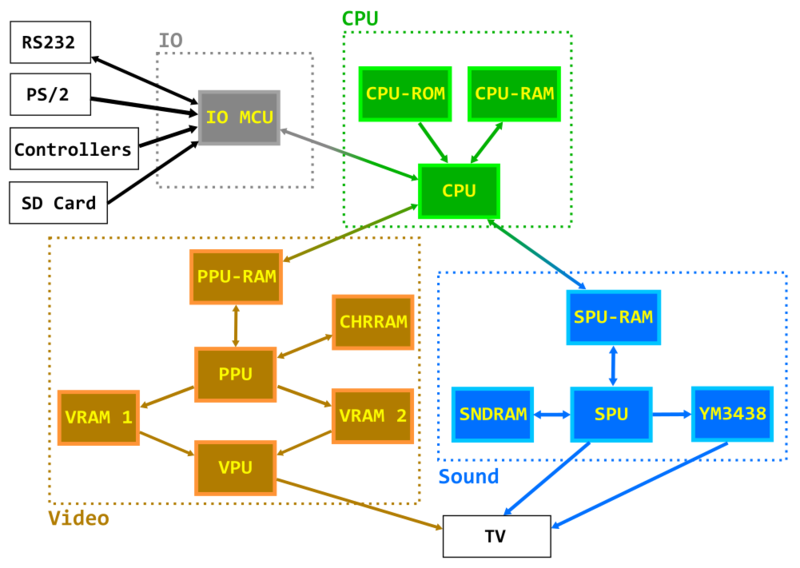 It accesses the PPU-RAM, SPU-RAM and the IO MCU through IO space. It’s also possible to develop programs using the SDCC compiler and some custom tools to use C language. This makes development quicker, although it could lead to less performant code. Wave samples are converted to 8-bit 8Khz PCM samples. Patches for PWM SFX/music can be composed using pre-defined instructions. And as for Yamaha YM3438 FM Synthesis chip, I found that the application called DefleMask can be used to produce PAL-clocked music targeting the Genesis sound-chip YM2612 which is compatible with the YM3438. The program’s binary, the graphics and the sound are combined into a PRG file. A PRG file has a header indicating if the program has custom graphics and/or sound and what’s the size for each as well as all the corresponding binary information. To help with the development of software for the console I’ve developed an emulator in C++ using wxWidgets. In order to emulate the CPU I’ve used the libz80 library. This project was truly a dream come true, I have been working on it for some years now, on and off during my free time, I never thought I would reach this far into building my own retro-style video game console. It certainly is not perfect, I’m still by no means an expert on electronic design, the console has way too many components and undoubtedly could be made better and more efficient and probably someone reading this is thinking exactly that. 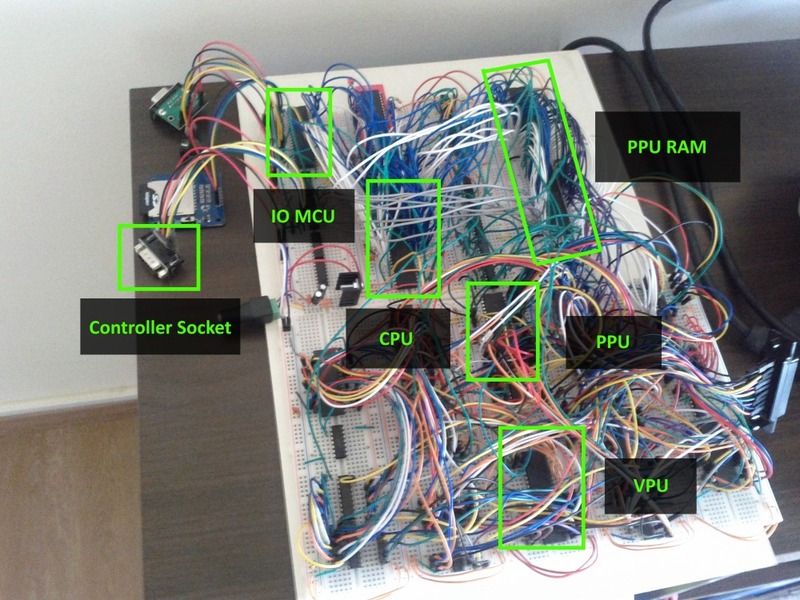 However, while building this project, I’ve learned a lot about electronics, game console and computer design, assembly language and other interesting topics, and above all it gives me great satisfaction to play a game I’ve made on hardware I’ve made and designed myself. I have plans to build other consoles/computers. In fact I have another video game console in the making, almost complete, which is a simplified retro-style console based of a cheap FPGA board and a few extra components (not nearly as many as in this project, obviously), designed to be a lot cheaper and replicable. Even though there’s a lot I’ve written about this project, there certainly would be a lot more to talk about, I barely mentioned how the sound engine works and how the CPU interacts with it, there’s also a lot more that can be said about the graphics engine, the other IO available and pretty much the console itself. 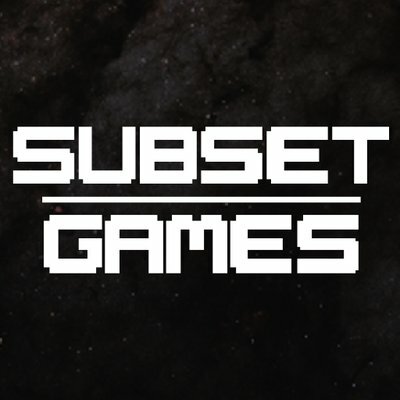 Depending on the feedback I might write other articles focusing on updates, more in depth information on the different modules of the console or other projects. These websites/channels not only gave me inspiration but also helped me with solutions to some of the difficulties I have encountered in the making of this project.